In today’s Small Business Success interview, we’re featuring Escape 45. Escape 45 is a fun Baltimore-based company that provides people with the ultimate escape room experience. 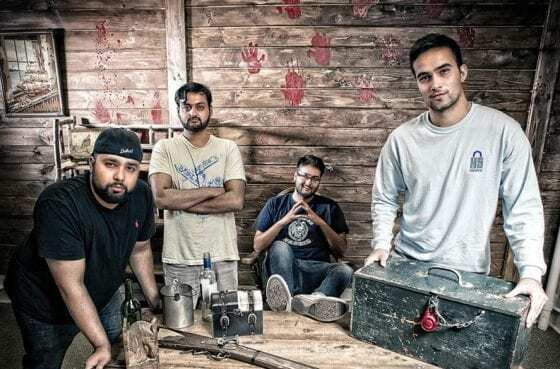 We talked with Ashraf Afzal, one of the business’s founders, to learn more about him, Escape 45 and its current success. Ashraf purchased an A-Frame sign, acrylic sign, and a brushed aluminum sign for his exciting escape room business. You can see some of their custom signs in the pictures throughout the interview below. My favorite topic! Just kidding. I’m a 27-year-old Johns Hopkins alum with a B.S. in neuroscience and an avid interest in technology and winter sports. The decision to start Escape 45 was quite a departure from the career I originally outlined at the onset of my college career, but I am thankful for the career shift. Entrepreneurship has been an immensely fulfilling adventure, and I look forward to sinking my teeth into the startup world further in the years to come. I’m originally from Michigan, and very proud of my Motown roots! I moved to the East Coast solely due to my admission at my alma matter. At the time, I was clear that I wanted to be a doctor, and concordantly Johns Hopkins seemed to be the correct move. Hopkins was a wonderful experience, as it exposed me to a breadth of personalities and possibilities, which ironically played a large role in my departure from the medical world. On perhaps another interesting note, my parents both have a career that reflects rather clearly in my own history. My mother is a radiologist, and my father is an entrepreneur with a company that serves patients across 36 states. I work full-time with my father, and started Escape 45 because of my interest in the industry after playing an escape room in Washington DC in early 2015. I was intrigued by the creativity and enigmatic nature of the rooms, and decided it was something I wanted to create myself. What does Escape 45 do? Escape 45 aims to provide its patrons with an immersive and captivating escape room experience. An escape room is an exciting new form of entertainment that tasks players with figuring out how to escape a themed room by solving puzzles, locks, riddles and mechanisms. We offer three themes with totally different experiences – the Lighthouse, Sully’s Haunted Cabin and the Jewel Heist. Our rooms cater to teams comprised of family members, friends, co-workers or even strangers! Escape rooms have a surprisingly wide application, appealing to couples on a date night, or corporate clientele looking for a team-building activity. 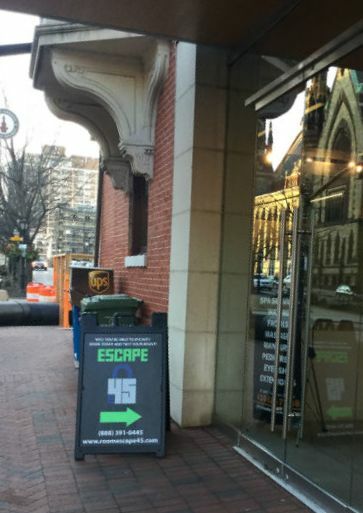 The idea for Escape 45 came from an impromptu trip to an escape room facility in Washington, DC. It was a fantastic experience, and one that was completely foreign to anything I had experienced before. I subsequently visited several other escape rooms, and got to work creating the themes and puzzles with the desire of establishing my own escape room business. Our greatest differentiating factors are our online presence, easy to use booking interface, and use of tools, such as Groupon, in order to spread market awareness. For example, we specifically designed our booking interface to be a 3-click process, and eliminated steps that would obfuscate the payment process, simplifying our call-to-action funnel. We used Groupon to establish market dominance early on, as we were able to leverage their large network into a surge of initial customers. This gave us an edge on our competitors simply because Groupon helped our brand to grow tremendously and rapidly. We were a recognizable brand much earlier than our competitors. Also, our Groupon campaign was set up to only allow for customers to get vouchers for Jewel Heist room. This meant that if customers were intrigued by our other rooms, they would have to pay the full booking rate. Fortunately, this worked out well for us because we had many repeat customers that initially used Groupon to book a session in the Jewel Heist returning to book either or both of our other rooms. Our most successful strategy for gaining customers has been marketing ourselves aggressively online. We post to our Facebook page every single day, providing potential customers with evidence of our popularity and reputable standing as a local business. We also have a blog on our site that is updated with news about the escape room industry and puzzles in general. A blog shows our website visitors that we are not just a faceless organization, but rather escape room enthusiasts that actively strive to impart our customers with an incredible experience. The most difficult aspect of customer acquisition for us has been in convincing potential buyers that our ticket prices are warranted. 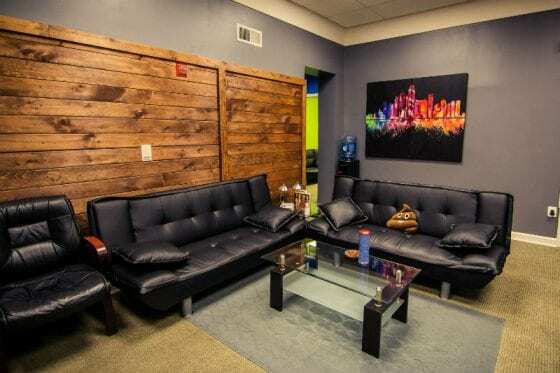 Not many people are familiar with the idea of escape rooms, so there is an unfamiliarity obstacle we need to overcome when attracting customers. We need to convince our audiences that $22 per ticket is an attractive proposition, and the best way to do this is by emphasizing our positive customer testimonials and heavy customer traffic on our social media. Slow and steady wins the race. With the exception of startup companies that offer products that are truly “0-to-1” in nature (i.e. an innovation that is 10x greater than the current status quo), I believe expansion can also be deadly for a business, if gone unchecked. As such, we don’t try to immediately compete with the biggest names in the escape industry. We are looking to be the biggest escape room in Maryland, before attempting to expand further. It is important to know your financial and organizational limitations and plan accordingly. Specifically, we try to foster a social media campaign that is designed towards crafting a sense of intrigue in our offerings and professionalism in our capabilities. We have highly customized campaigns on Facebook and Google AdWords, along with decent organic SEO due to our publications across several local media outlets. We also run 2 separate campaigns, with one focusing on general consumers and the other specifically on corporate clientele. The biggest challenge I have had with my business is the hiring process! While I strive to ensure our staff is filled with competent and ethical employees, it can be a difficult undertaking. As our business regularly deals with cash bookings, it can be quite tempting for employees to not report cash bookings officially. To combat this, I have had to install a few cameras in the lobby and staff areas and instituted a 1-strike instant termination over such an occurrence. This was effective in minimizing the lost revenue, however, it remains an ongoing battle. When dealing with employees, it can be frustrating that so much of your success is contingent upon their efforts. This is exacerbated when the efforts of your employee can fluctuate based on their mood or temperament. My most effective practice towards ensuring a healthy office environment is being in a daily open dialog with all the employees on any shift. I also let my employees know that I appreciate their efforts through small measures such as bonuses during the holiday season as well as quarterly team-building events where I seek their feedback in detail. While we do use cameras and enforce punishments, our main methodology is to foster a positive company culture in order to minimize the onset of negative behaviors. I generally hesitate to reflect on possible regrets, as it is often those same mistakes that lead to the great insights for future redirections. However, experience has provided us many lessons that would have left to different actions during our development, if only we were previously aware. One of the chief lessons we learned was that we should not have opened our facility at a price point lower than our competitors. It was a mistake to chase a value proposition that denominated us as a cheap (i.e. low quality) escape room. We ended up having to run a ‘mini public relations’ campaign that was geared towards establishing Escape 45 as an immersive, premier escape experience that warranted a higher price. Lowering our prices was a premature decision that did not benefit our business. We would have been able to make a significantly greater amount of revenue if we had simply matched our competitors’ prices. Be Unique – What makes you stand out from your competitors? Is it an improved product or service? Is it a commitment to customer outcomes over profits? Find what your ‘unfair advantage’ is, and market it with zest and clarity. Customer Service – See answer below! It is also the best source of advertising, as word-of-mouth is an extremely powerful referral channel. And it’s free! Constructive Criticism – Constantly get feedback from your customers and vendors. As owners, we can occasionally lose sight of the direction our ship is headed towards as we are too bogged down simply ensuring the sails are upright. It is imperative to pay attention to your industry’s trends and the movements of your competitors. Furthermore, checking in with your customers afterwards displays a level of sincerity in your intent to provide a quality product/service, and gives you tremendous insight on how to improve your business. Lastly, checking with employees is hugely beneficial, as it provides you a working level understanding of your business’s needs and concerns. Don’t Rest – It can be enticing to start taking it easy once your business starts to return a healthy profit. Do not fall for this! Never lose sight that you must continually improve and build your brand, otherwise you may find your success rather short-lived. Two words: customer service! While we put great effort in our rooms and puzzles, I am a firm believer that great customer service is the best long-term growth strategy for small businesses. Specifically, we constantly keep in touch with our customers via automated requests for feedback and an email newsletter that lets them know whenever we’ve made a new change to our rooms or are running a promotion. I believe there is quite a bright future ahead for our business. We are looking to expand to another location this year, and hope to cement ourselves as an escape room franchise within 2 years, with several locations across the U.S. I would like to also develop parallel streams of entertainment services, such as physical maze and obstacle course experiences. I think the escape room industry is poised for immense growth in the next 2-4 years. This is a relatively new genre of entertainment that is spreading in popularity by the day. While I would love to claim that our business is poised for growth because of our own ingenuity, there is a huge tidal effect lifting the entire escape room industry because of its relative novelty in the U.S. market. Escape rooms have been in other parts of the world for over a decade, whereas the U.S. market is just 3 years old. We’ve grown from 0 employees during our launch (Feb 2016) to over 12 part-time employees now (Dec 2016). Our profit margins also have afforded us the ability to discuss a second location within the near future. Editor’s Note: Thanks again to Ashraf for taking the time to chat with us. His dedication to his business and customers, as well as his enthusiasm to take on the startup world by the horns is clearly evident and paying off. Ashraf said that one of today’s best ways for small businesses to market themselves is through aggressive online marketing and having a good social media campaign. He also reminded us that the best long-term growth strategy for any business is providing great customer service. And we couldn’t agree more with this smart Johns Hopkins grad turned escape room business owner and enthusiast. Thanks again Ashraf, we wish you and Escape 45 even more success in the coming years!